Last friday, I was able to join the Xavier School community in welcoming 2011's Xavier-Kuangchi Exemplary Alumni Award winners at the Angelo King Multi-Purpose Center. We honored two outstanding Xavierians who have made great contributions in their respective fields. One of them was a proud leader in the scouting organizations of the Philippines, and the other served as a top ophthalmologist, helping a lot of people who can't afford to have eye surgeries. Aside from these two individual awards, the Luceat Lux Lifetime Achievement award was also handed out to a unique persona; Fr. Ismael Zuloaga of the Society of Jesus. 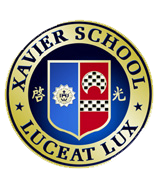 His great contribution and leadership helped to create the foundations of Xavier School, and even at his old age, he continues to create a stirring influence of progress within the hearts and minds of the students. 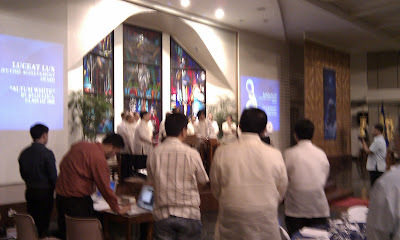 During his speech for the ceremony, Fr. Zuloaga explained that he believed in the ability of Xavierians to become doers in life. He mentioned that while other people simply think and plan, Xavierians learn to act and react to the different situations that are presented to them. Growing up within this community myself, I've learned that the best way to create change is by being a catalyst for it yourself. Doing things and dreaming things are not the same, but we need both in order to gain significant accomplishments in our own fields. Whether it be in medicine, the fine arts, scouting, or business, I'm very proud of Xavier School for training its students to be ready for a complete emergence in any of the diverse industries that await them. I created a sculpture for Fr. Zuloaga, to symbolize his lifetime achievement at Xavier School, and to remind him that the entire body of our community supports him and honors his lasting influence. The sculpture was made as the emblem for the Luceat Lux Lifetime achievement award that was bestowed upon Fr. Zuloaga after the two Xavier-Kuangchi Exemplary Alumni Awardees gave their own speeches for the night. Meeting up with old and new friends like Jan Benedict Yap, Mauro Tongco, and Karol Yee made the night an even more enjoyable experience. I was also able to see some of my old professors like Sir Exxon Yu, Fr. Guy Guibelondo, and Sir James Rivera. The Luceat Lux Lifetime Achievement Award and A Splendid Night at Xavier's Exemplary Alumni Awards.